Angry Birds fans have a special gift this Valentine;s Day — the wildly popular pig-flying game made its official debut on Facebook. The Facebook version includes four new power-ups, including "sling scope" (for better targeting), "king sling" (for more power and velocity), "super seeds" (to supersize your bird, turning it into a "pig popping giant"), and "birdquake" (to shake the battlefield and bring down pigs' defenses). Besides being gifted with power-ups, players can earn them through game play or purchase them. 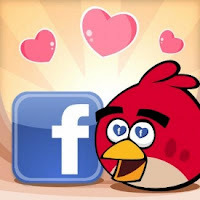 And - even better - anyone who plays the game between now and Feb. 16 will receive 14 free power-ups as a special Valentine's Day gift from Angry Birds developer Rovio.